Kayaking is one of the fastest growing sports in the world. The feeling of independence and achievement is topped off by making a journey on a stunning alpine river. Our Beginners Course is the perfect introduction! Once we have our kayaking apparel, we will adjust the kayaks to make sure they are the perfect fit with regards to length, width and volume. If you have a good connection with your kayak, it will make controlling and stabilising the boat way easier thus giving you more confidence. It is a short drive up to one of the mountain lakes we use here in the Arlberg with stunning views of snowcapped mountains and glaciers. There the Kayak School Instructors will give you a full safety briefing including demonstrations followed by a gentle warm up and a few dry land practices. Now it is time to get onto the water!! We spend time getting used to our kayaks, gaining confidence and balance. Learning to turn the kayak is first, followed by the fundamental skill of forward paddling through to lunch. Lunch will be taken at one of the benches and tables by the side of the lake. Throughout the day your Instructor will set you challenges and, while giving feedback to each person helping them to improve their techniques throughout the course. With fun and games also included in the activities you will be surprised just how much more confident you can become within a short time. In the afternoon we start the session with some practices and techniques we learnt in the morning. We continue learning more fundamental techniques such as edging the kayak and preventing the kayak from capsizing or flipping. Throughout the day you will have plenty of opportunity to paddle around the lake and with individual feedback to really help you develop! By the end of the first day we come to the stage where everyone will have to perform a wet exit. Sometimes this happens during the day when we are playing games such a canoe polo or tag. If not, at the end you will receive another explanation from your Instructor about what to do. Then in your own time you flip the kayak over, pull the deck and exit. It is just a few metres to the bank where you collect the paddle and empty the water out of the kayak and that is day 1. A great start not only to the course but a fantastic introduction to the sport of whitewater kayaking! We find ourselves back up at the lake in the morning of day 2. Improving the techniques we learnt yesterday will be the first step before we start to understand and learn about the flow of a river. We stretch the legs and take a drink followed by a river theory explanation using our little smurf and drawing the standard features of a river in the sand. Now back on the lake we add the river theory to our fundamental techniques for the rest of the morning. We take lunch again on the benches and picnic table by the lake. Our plan and goal for this afternoon is to kayak a very mellow piece of moving water, getting used to the current of the river and feeling more balanced and confident the further we continue. We stop along the way (eddy out) to practice essential river techniques such as moving from one side of the river to the other (ferry gliding) or carving a kayak (turning). Not forgetting to take in the amazing mountain scenery. It is just a few kilometres of a moving Class 1 river but it is such a great feeling to have kayaked your first river! The Lech is absolutely stunning. Just to reach the put-in we drive over the Arlberg and Flexen Passes to the village of Lech. Then we drive high above the Lech Gorge before descending into the valley and our put-in. After a quick shuttle of the vehicle we start our journey. We are kayaking on a beautiful river in the heart of a Nature Park. Along the way we eddy out to work on ferry gliding, eddy drills and just admire the scenery. There are plenty of waves and easy rapids to negotiate and with both a cycle and famous walking path following the river we kayak past the onlookers with style! We stop for lunch by a rustic wooden bridge, there are a few benches to sit and look at the pastures and grasslands full of alpine flowers and the steep snowcapped mountains of the Lechtaler Alps. We continue our journey down the river with stops along the way to practice and work on our fundamental techniques. The final third of the river we just go with the flow, kayaking downstream, running waves and rapids, eddying in and out maybe to catch a breath, drink some water or to reflect on the wave we just hit or rapid we kayaked. The River Inn is a firm favourite of ours. More known for its big rapids and whitewater, there is however a very quiet side of the River Inn and it is this section that works perfectly for our Beginners Course. From the put-in we have plenty of places and opportunities to practice all of our whitewater fundamental skills and techniques. We take lunch by the side of the river with fantastic views of a castle built onto the cliffs. After lunch the river starts to pick up and so do the waves and rapids. We bounce down fun rapids enjoying the odd break in whitewater to take all the views in. Sometimes we see climbers on the crag by the side of the river watching us running a rapid. At the take-out our vehicle is waiting with our dry clothes. A final few photos, pack the kit away, secure the kayaks and we head back to base Arlberg. Both the River Lech and River Inn provide a fantastic end to a thrilling day on Kayak School Arlberg’s Beginner Kayaking Course! All of our instructors / coachers are fully trained and qualified, with up to date first aid courses and have a wealth of experience teaching kayaking not just in Austria but all over the world. They will tailer the course to your individual needs which enables you to learn at your own pace and with the utmost of professionalism your kayaking skills will progress extremely fast. The instructors carry a throw bag, rescue, first aid kit and of course your lunch! 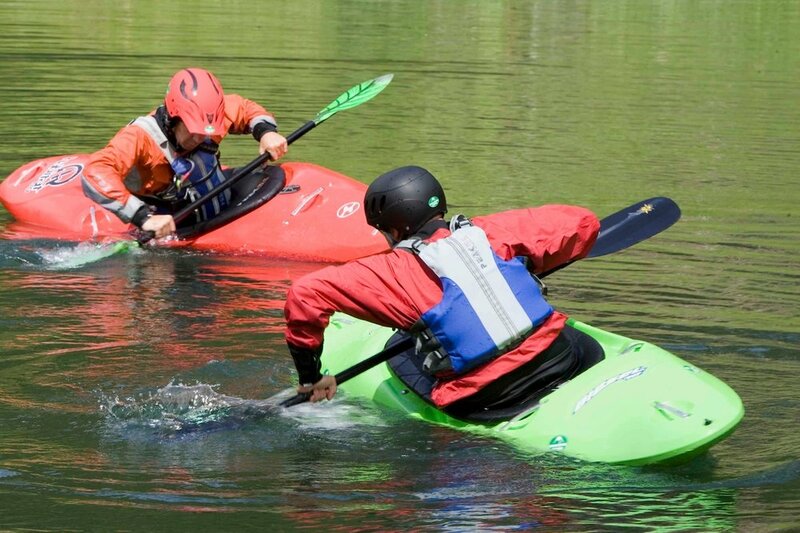 We teach a modern dynamic style of kayaking and our equipment reflects that ethos. Our kayaks include some of the most dynamic, enthusiastic and leading brands available. All of our kayaks in the Kayak School, we have either paddled or would consider kayaking in. This gives us an in-depth knowledge of the kayaks strengths and weaknesses helping you have the best kayak for your size and goals! Our Beginners paddles are exclusively made for our Kayak School giving you a huge advantage when learning to paddle forwards! Our apparel is from the award winning Peak UK, made by kayakers for kayakers. You will receive for the duration of the course a helmet, wetsuit, kayaking jacket, booties, spray deck, buoyancy aid (PFD) and semi-dry trousers if the weather is chilly. Our Peak UK kit not only performs well helping you to stay dry and warm, but it also makes you look like a kayaker - just look at our photos! Throughout the course you will need: a thermal top, swimwear, suncream, towel, water bottle and a change of clothing. Our ratio for the Beginners Course is 1:3. This gives you plenty of opportunity to improve and get to grips with the fundamentals of whitewater kayaking. It also gives you a great feeling of security and safety with such a small group to instructor ration! Also our Beginners Kayaking Courses are guaranteed to run with just a minimum of 2 persons. No matter what the weather, you can always find a river to kayak! That is just one of the advantages with a such a sport. Yes, it is great to kayak with deep blue skies and sunshine all day. However, if the weather changes it does not ruin your holiday! We have equipment for whatever mother nature throws at us so whether you are coming in the Spring, Summer or Autumn, the rivers will be running and we can go kayaking! Kayaking is a dynamic sport. Though you do not have to be an Olympic athlete, an active lifestyle will certainly help. We will be kayaking for around 4-5 hours each day. You are spoilt for choice here in the Arlberg. The region offers camping, bed and breakfast, holiday flats and of course hotels. If you would like to help searching for your ideal place to stay just drop us a message. Our core partners offer great prices if you are coming here to kayak. Throughout the season you have plenty of options when it comes to restaurants. Be it a Tiroler Groestl, Wiener Schnitzel, stake or vegetarian, there is something filling and tasty in our local restaurants. The bakery and pastries are fantastic and we can always make a stop at one of the local producers of mountain cheese, cured sausages or ham heading back from the river. If you are staying in the local Stanzer Valley (between St.Anton and Schnann) we will come and pick you up in the morning and drop you off after kayaking. There river shuttle is undertaken with one of our cool little monkey motorbikes. If you have questions about vehicles or getting here then just drop us a message. No date to suite your plans? Just let us know through the contact form. We are pretty flexible here at the Kayak School giving you the best opportunity to see the region from a different perspective.